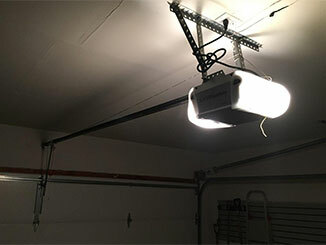 Although the springs and the cables are the ones that do the actual heavy lifting when it comes to opening and closing your garage door, the opener's role is just as invaluable. It is the motorized unit that controls and powers the movement of the door, and as such a complex device, it can suffer from all sorts of malfunctions as it ages. Whether you find yourself dealing with a mechanical problem or an electrical issue, you can count on our team for help. Well, there is a wide range of problems that your opener can potentially suffer from, but most of those are probably not going to manifest, especially if you make sure the unit receives regular maintenance. However, some issues are more common than others, like problems with the drive system (i.e. a snapped chain or a torn belt) or issues with the motor (like worn or broken gears). As for electrical problems, those can range all the way from issues with the remote control's wiring to more complex malfunctions that will require the circuit board to be replaced. Apart from lubricating moving metal parts, like the chain or the screw part of the drive system (depending on which kind you have, of course), there should be some safety tests performed, to ensure the opener is capable of adequately detecting when there's an obstacle preventing the door from closing all the way. The safety sensors need to be in complete alignment with each other, and the force settings of the auto-reverse mechanism need to be checked and adjusted accordingly. There are a lot of new technological advancements that may be worth investing in. Modern opener models have the capability to be controlled and monitored from anywhere, via their Wi-Fi connectivity features. The also utilize rolling code technology, which makes them far more secure and burglar proof than their predecessors, and they can also be equipped with a backup battery, which will kick in when the power goes out unexpectedly. Modern units are also far quieter, and more reliable. Choosing the right one for your home can be tricky, but our experts are always happy to consult customers and to guide them through the shopping process. We will then take care of the opener installation, and make sure your new motor unit is working flawlessly from day one. Whether you need emergency repairs or you simply seek professional advice, our team here at Garage Door Repair Hastings will be happy to help you any way we can.